Hola Amigas! It's been too long since my last post. HAPPY NEW YEAR! It has been a very busy and interesting month. I am hoping that everyone started off the New Year on a GOOD NOTE! 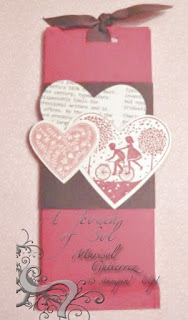 Today I am sharing Valentine Pull Treats. These are great gifts for teachers, co-workers, etc. If you change the theme, they also make great favors for all occassions. 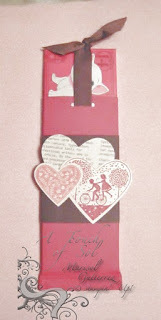 I used a new stamp set from the Ocassions Mini 2012. The name of the set is Take It To Heart. Another new item I used was the Framelits-Hearts Collection. Here you see the treat pulled up to reveal the chocolate bar. You can also do this with popcorn bags, hot chocolate, gum, etc. So what do you think?